Launch day is fast approaching for Calipso! Friday 21 April, the French-U.S. satellite will be orbited from Vandenberg Air Force Base, California, ending a wait of several months after a series of postponements. Once in orbit, the satellite will take up its place in a unique constellation of 6 spacecraft called the A-Train. The French-U.S. Calipso satellite is set to embark on its mission to locate clouds and aerosols, determine their altitude and optical properties, and measure their radiative impacts on Earth’s climate. Stationed in near-Sun-synchronous orbit at an altitude of 705 km, Calipso will establish vertical profiles of the atmosphere to study the role of clouds and aerosols in the climate system. With the U.S. CloudSat satellite, it is set to join the A-Train* space observatory, a unique constellation that will ultimately have 6 satellites designed for atmospheric research. The A-Train currently comprises 3 satellites in orbit, including CNES’s Parasol microsatellite. With Calipso and CloudSat added to the constellation, 5 satellites will be acquiring measurements using different remote-sensing techniques, only minutes apart. The A-Train thus constitutes a true space observatory that will yield significant data synergies. 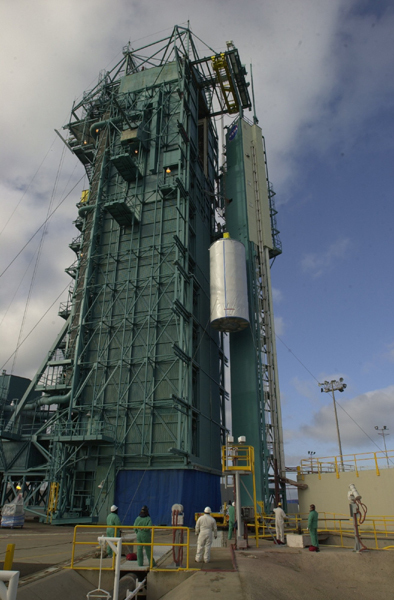 Calipso will be orbited by a U.S. Delta II launcher on 21 April. The joint NASA/CNES mission will launch with the U.S. CloudSat cloud-observing and climate monitoring satellite. Calipso and CloudSat are all ready to go at Vandenberg Air Force Base atop the Delta II after successfully completing final checks. Calipso marks a new step forward in French-U.S. cooperation in Earth observation and sustainable development—a focus of major efforts in France and the United States. Calipso and CloudSat will launch 21 April at 12:02 p.m. Paris time. The launch will be broadcast live on Nasa’s website. To mark the launch, CNES is devoting a special website to space and climate giving a new perspective on climate concerns from the high ground of space. *A-train for “afternoon train”, since the 6 satellites in the constellation will cross the equator daily one at a time, a few minutes apart, at around 1:30 pm local time.